The original 1941 Dumbo movie was produced by Walt Disney Productions and released by RKO Radio Pictures. It was the fourth Disney animated feature film, and it is based upon the storyline written by Helen Aberson and Harold Pearl. The new live-action adaptation was directed by Tim Burton, and it borrows heavily on the original while avoiding the talking animals. 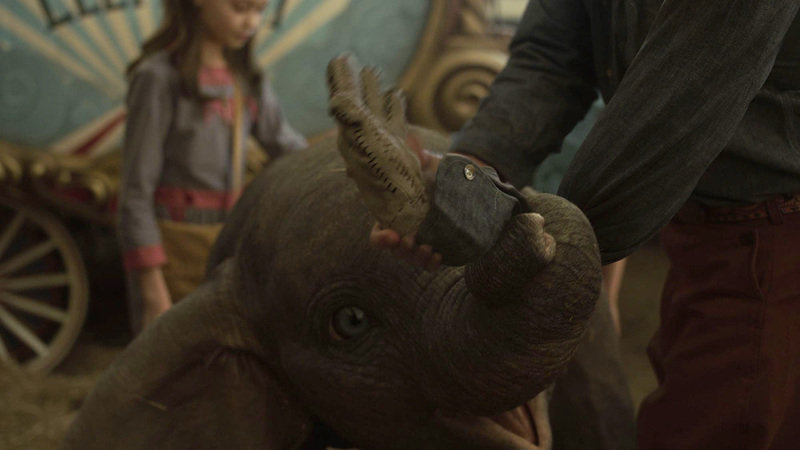 The film instead focuses more on a family that works at a failing traveling circus, as they encounter a baby elephant with extremely large ears. 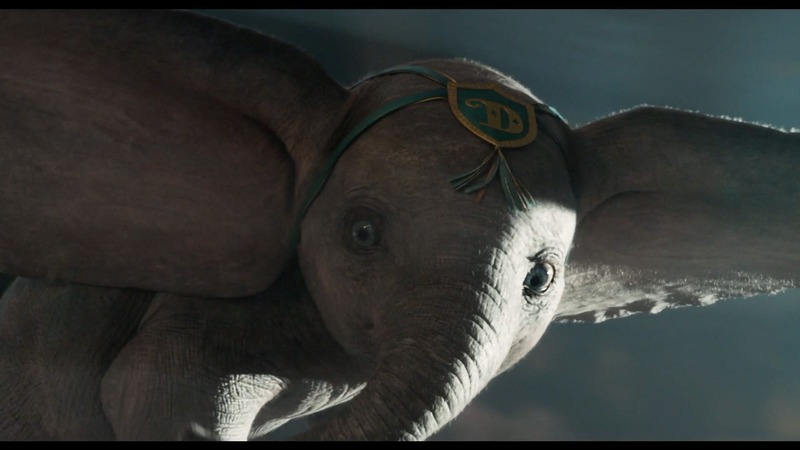 MPC did the vast majority of the visual effects, delivering 1,200 shots, primarily for the character animation of Dumbo, the little elephant who can fly. The visual effects supervisor for MPC was Patrick Ledda. All the animals in the film were digital, with the exception of some domestic horses and dogs. Disney clearly wanted tremendous character animation, and were also mindful of audiences’ aversion to any hint of potential animal abuse. 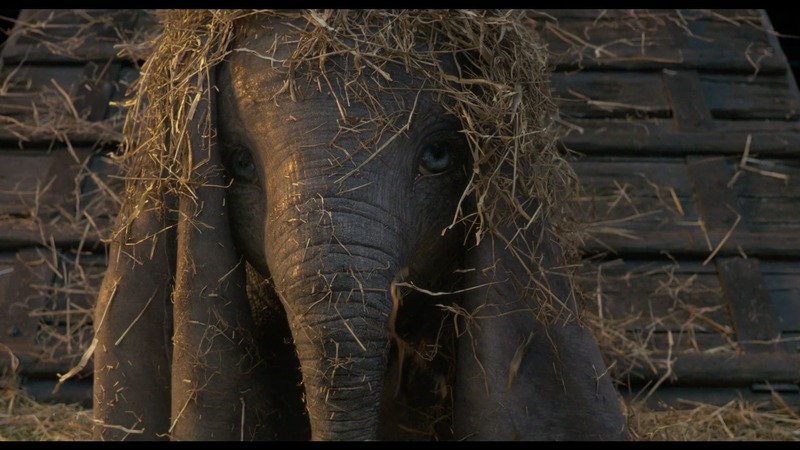 The Dumbo elephants are not strictly Asian elephants and so there were a series of small changes, apart from Dumbo's ears, director Tim Burton wanted to make the elephants read more cinematically. For example, Asian Elephants are very hairy and often use mud and dirt to stay cool. However in the 1930s, circuses actually used to shave elephants and clean them. So the director wanted them a bit cleaner and a bit more idealised. 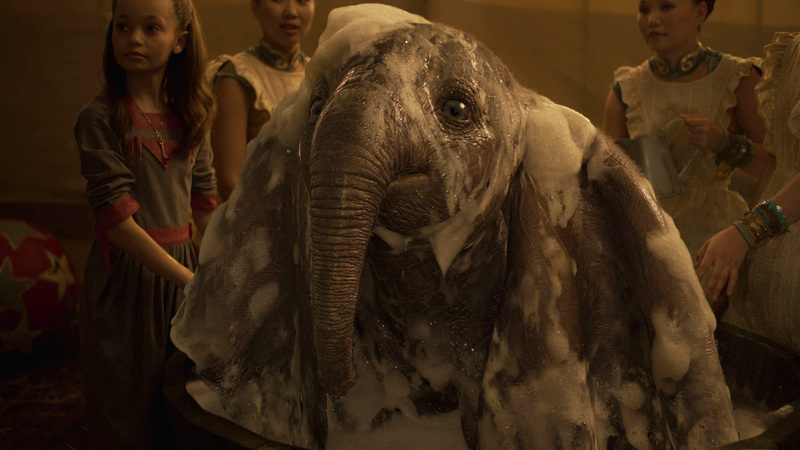 Dumbo presented a special design challenge, as a balance had to be found between the slightly stylised Asian Elephant breed of his mother and the cartoon version of Dumbo from the original film. 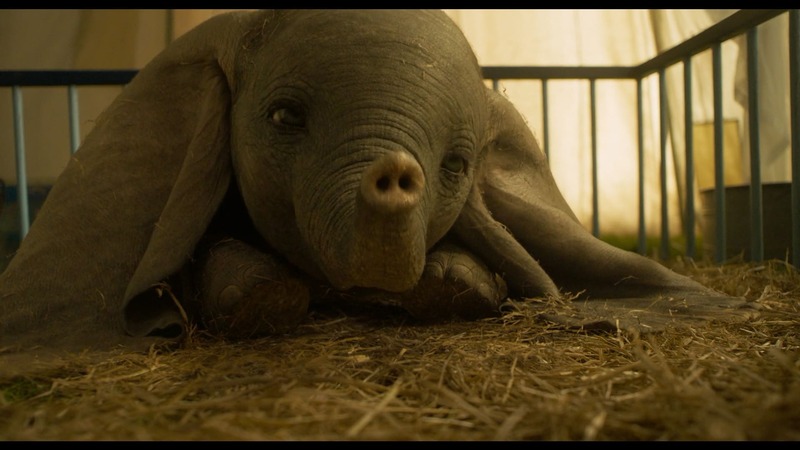 The most significant differences were the ears and eyes of Dumbo. The eyes are blue, as per the original film. The eyes are also rounder and with less skin around the eye socket region. The team needed the eyes to look completely real even though they are larger and more cartoon-like than would be the case in reality. This was the complex line MPC had to navigate. Ledda comments, "So obviously, the issue was how do you make the eyes look real enough to sit in a world of live action actors, but at the same time reference the original cartoons… so that was always the balance,” comments Ledda. Dumbo eyes are actually very different. MPC didn't want to go too realist, but they also wanted to use as many real elephant properties as they could. 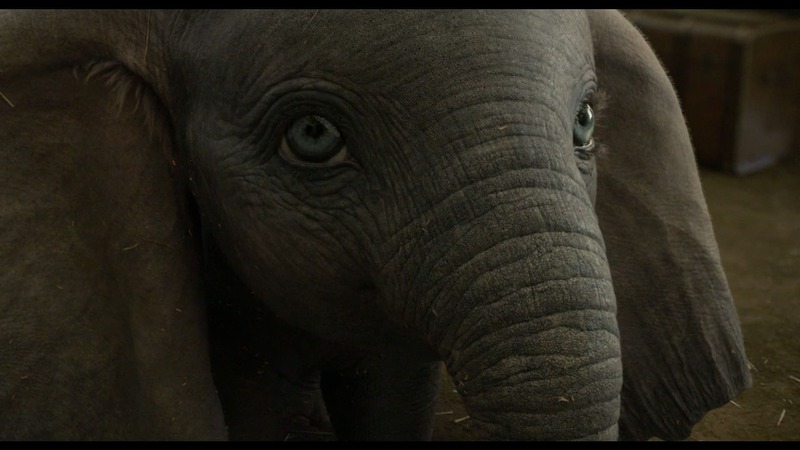 "So the actual eyeball, the structure, the iris, the pupil and all of the texture and muscles are very similar to real elephants, and there is huge varieties of different elephant eyes anyway. But the shape and colour are essentially more like a human eye,” says Leeda. 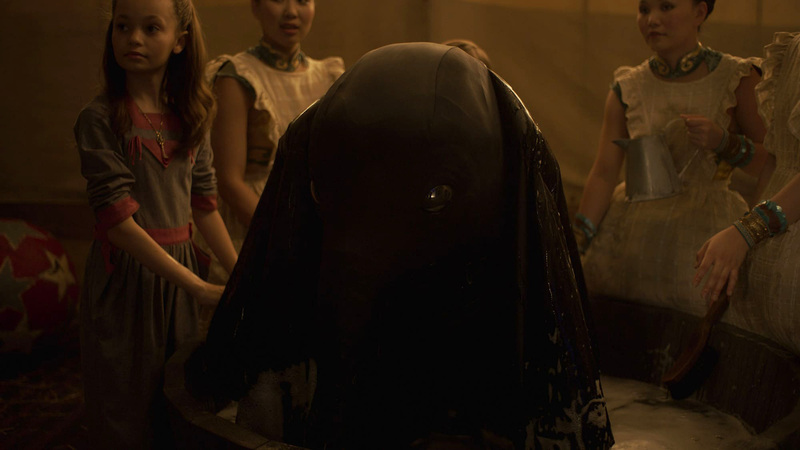 The eyes are also featured in closeup when Dumbo is watching the pink elephant bubble sequence. The camera repeatedly cuts back to a close up of the young calf looking up and watching the bubbles seeming to dance and move. Here, and at other times, the MPC team carefully played with the meniscus to control the impression of emotion welling up and the eye almost tearing up, as a subtle way to convey emotion in an otherwise static shot. The ears are of course the defining attribute of Dumbo. While the ears are enormous, they also affect the skull design and the connective tissue and cartilage at the side of Dumbo’s head. 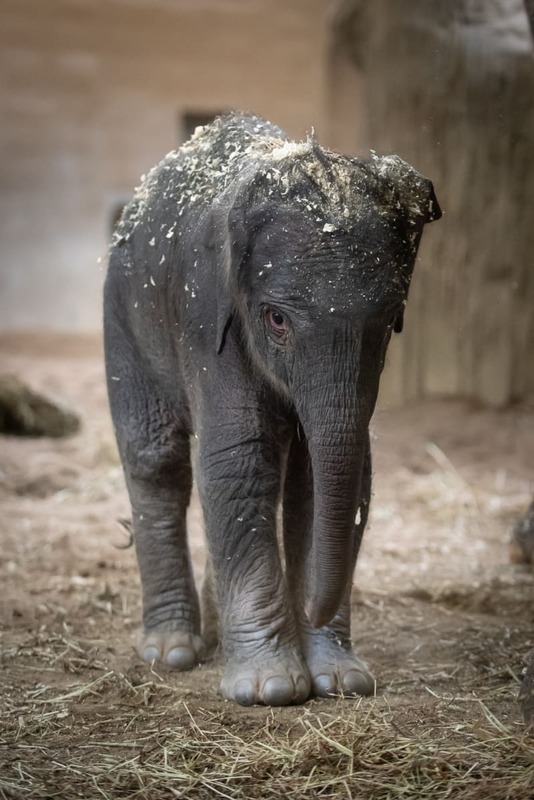 In many respects Dumbo’s ears are those of a much older male bull, but without all the ageing and wrinkles that such an older elephant would have. 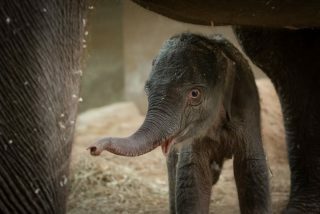 At the top of the skull is an ear bone and muscular tissues, and "even though it is meant to be an Asian elephant, we referenced two African Elephants, as they have much bigger ears,” Ledda recalls. Dumbo has ears almost the size of an adult African male, but softened and smoother in texture. For example, "African elephants have these huge veins and big muscles, with their ears sort of broken at the edges, with cuts and marks, but of course we wanted a more 'elegant' version of that,” he adds. The ears were animated in two stages. MPC had a rig puppet that had a lot of dynamics to allow the animators to see what the ears would basically do, but without specific detailed animation, more just rough key poses. It would be this first version that the director would see. The ears would behave more or less coherently but not have any nuanced shades of expression. 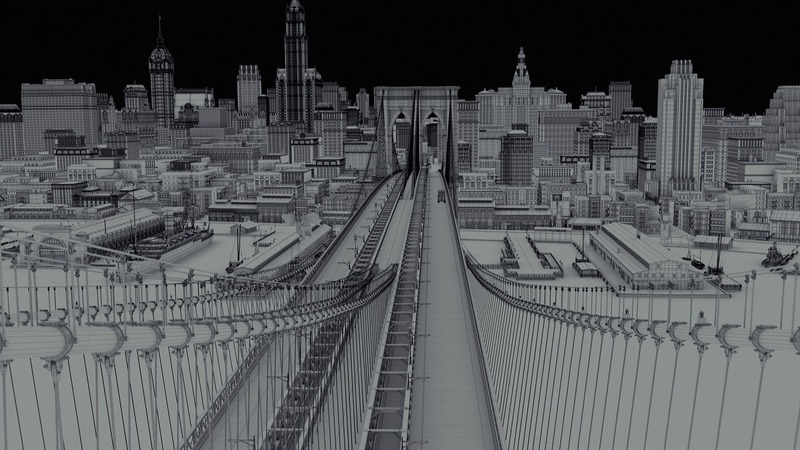 When Colette Marchant (Eva Green) is riding Dumbo, she was filmed on a six axis motion base that was programmed from the pre-viz. She was then lit and filmed with a combination of a motion control camera and synchronised lighting rig. This allowed the illusion of her flying past the camera, moving in and out of pools of light, while remaining anchored to the sound stage floor. Not only did the animators have to deal with interactions of hands patting Dumbo, but also CG hay, CG grass, and the 'fake' arm of Holt Farrier. 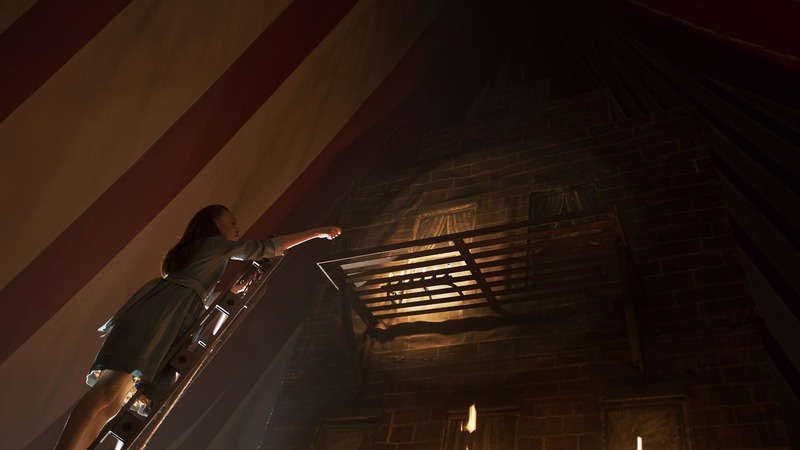 A variety of 3D and 2D projection solutions were used to have the character interact fully and sit in the shot. The trunk of Dumbo was animated essentially as a muscle. “There were lots of controls in the rig to allow us to control the movement and then again, on top of that, there was a dynamic system. So it, you'd get a little bit of balancing, lagging and weight,” explained Ledda. Animating expressions with a truck is animation unlike any other, with the truck being neither a separate thing - such as a snake - nor a direct part of the face. 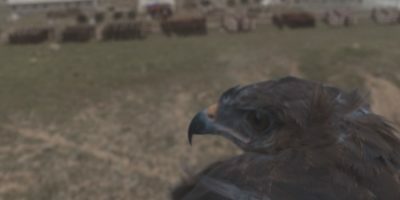 In addition to this, the story pivoted on the interaction between the trunk and feathers in multiple scenes, often in extreme closeup. Dumbo's flying is a combination of the huge ear movement and also a sort of galloping body motion at times which is a direct reference to the style of the traditional Disney animation from the 1940s. In traditional 2D hand animation, one can get away with huge amounts of cheat, in the sense that almost every frame can be different. "And 3D you just can't get away without it. The simulations would not work. So we had to be more rigid sort our approach, .. we experimented with this idea that we wanted to give it a sense that he's trying,.. it's almost like he's swimming. We also partially referenced a little bit Pegasus, if you think of a horse galloping with wings" explains Ledda. The overall challenge was realistically portraying the young elephant’s weight, while still making him seem comfortable flying. 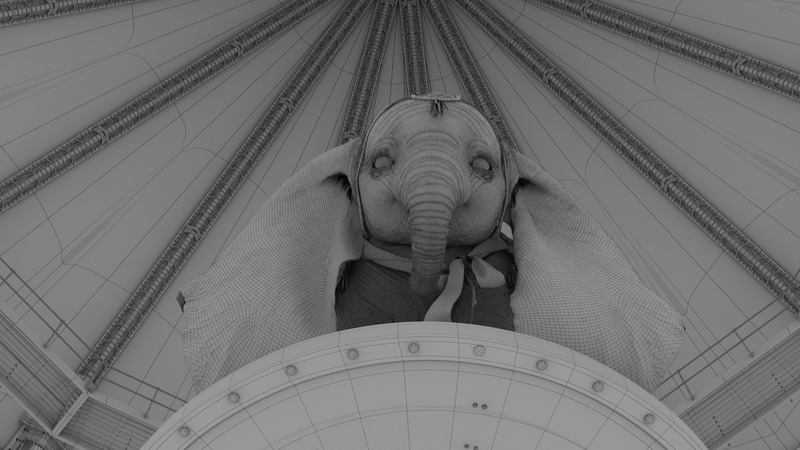 To achieve this, the Dumbo rig puppet changes a bit when he is flying, the system was engineered to allow his ear bone position to change to more easily accommodate what the animators needed. Of course, there is no reference in nature of such heavy animals flying, even birds are a poor reference, so here the team used both their imagination and also hints from sea creatures, such as Manta Rays. All the lighting and rendering was done in RenderMan. 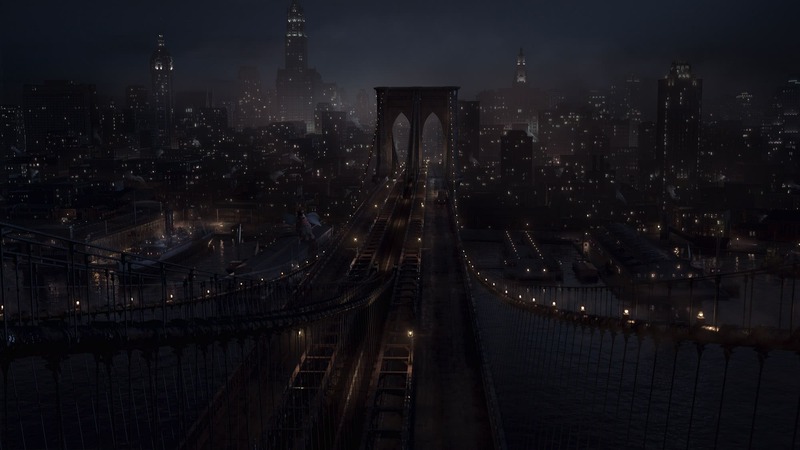 Dumbo is essentially grey so the lighting was at times challenging to look as engaging and rich as was needed. 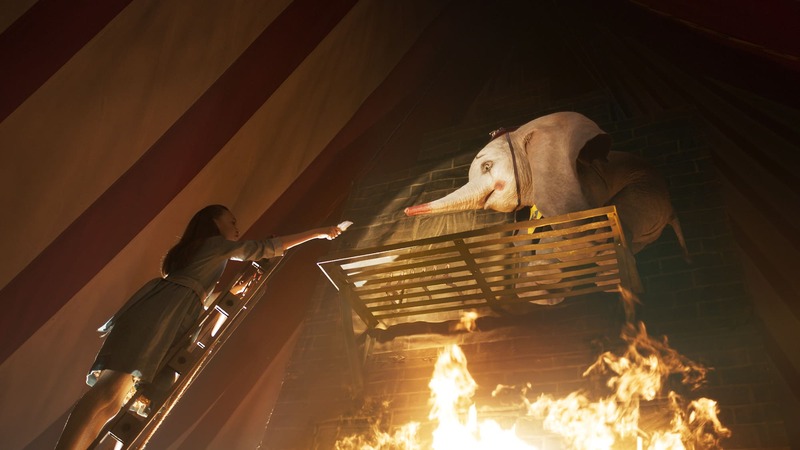 The exterior shots of Dreamland were provided by Framestore, who were the second largest contributor to the VFX by shot count. 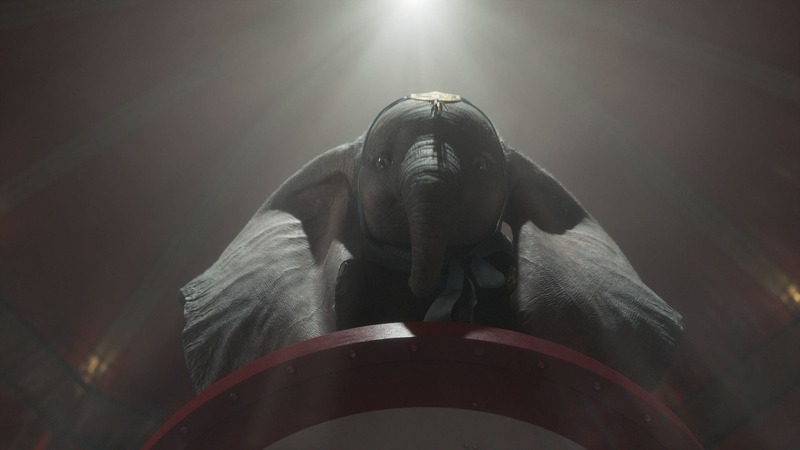 The two companies shared shots; for example where Dumbo was flying, MPC would provide the character work and Framestore would provide the exterior shots of Dreamland. But MPC did the interior colosseum shots of the crowds watching Dumbo fly. Other companies also contributed, including Rising Sun Pictures, who animated and produced the pink elephant bubble sequence. 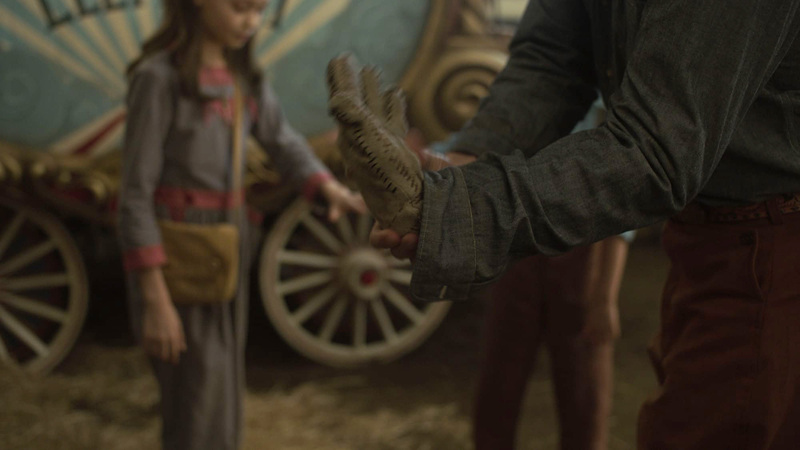 Rodeo VFX did the opening sequence and some of the arm removal for amputee Holt Farrier (Colin Farrell).